When planning your kitchen it’s really important that you consider how you want to fit your cabinets around corners. 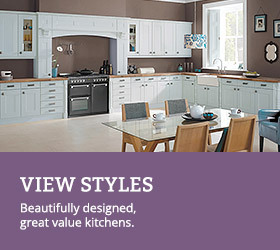 Here at DIY Kitchens we have a number of options that are both stylish and practical. 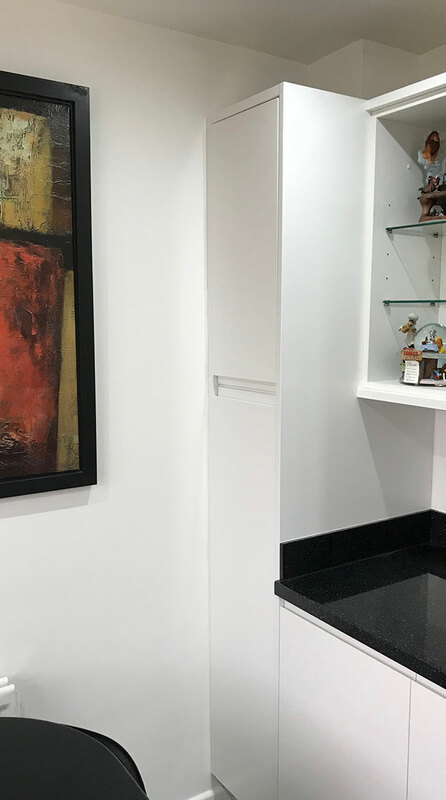 We are able to offer standard corner cabinets, ‘L’ shaped corner cabinets, curved corner cabinets and diagonal corner cabinets and we also have lots of clever accessories to make access into the cabinets much simpler. These types of corner cabinets provide the most flexible option for planning around a corner and incorporate a corner post, which is an essential component as it prevents your handles from clashing when doors or drawers are opened (See the green square below which shows the 70x70mm corner post). 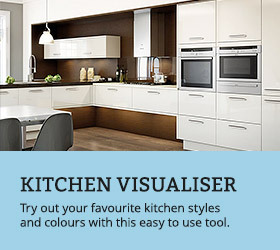 These cabinets are available in varying widths from 900mm to 1700mm, and, as a general rule when planning your kitchen, we suggest spacing your cabinet 130mm from the wall. 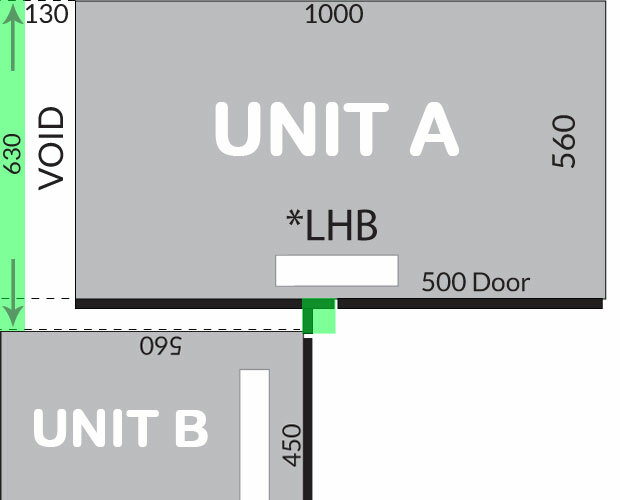 For example, if you wish to install a 1000mm corner base cabinet, the total space required is 1130mm and the adjacent cabinet would require spacing 630mm from the wall (Indicated by the green line below). 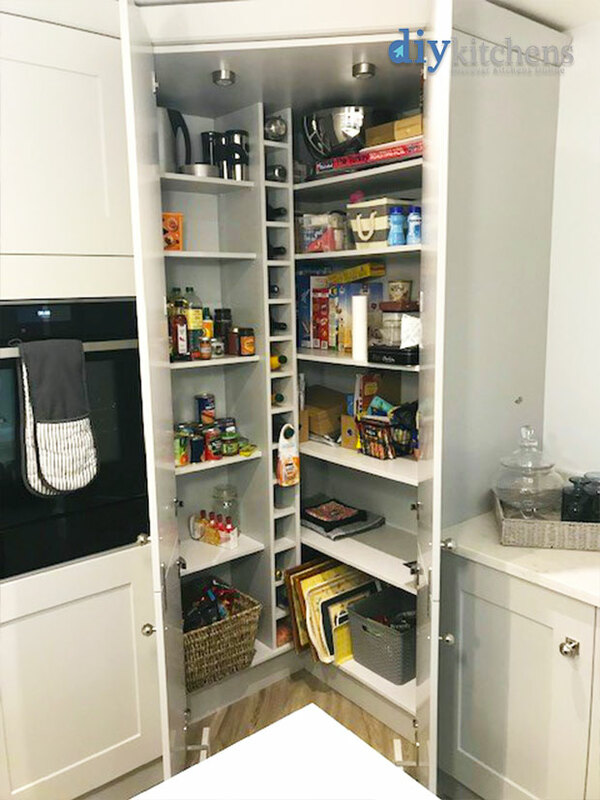 These cabinets are available in varying widths from 600mm to 900mm, and as a general rule when planning your kitchen, we suggest spacing your cabinet 30mm from the wall. For example, if you wish to install a 600mm corner wall cabinet, the total space required for your plan is 630mm and the adjacent wall cabinet would require spacing 330mm from the wall. 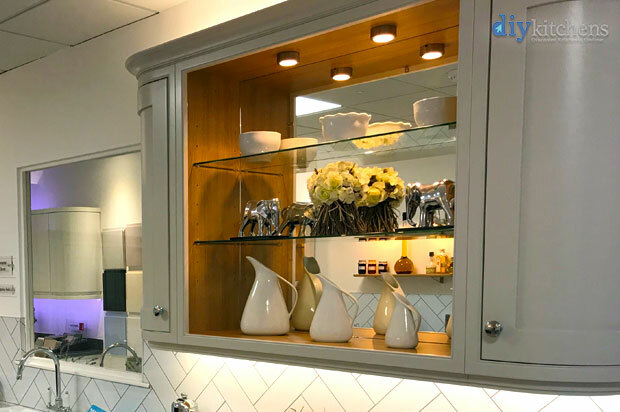 If you are unable to follow our general planning guidance for standard corner cabinets, don’t worry, here at DIY Kitchens we are able to supply you with panels (in the same finish as your door or cabinet) that you can cut to suit your requirements – just remember that you must take in to account the size of your handles and ensure that the layout of the corner doesn’t result in the handles clashing! ‘L’ Shaped, Curved & Diagonal Corner Base Cabinets – When planning this type of corner cabinet, you’ll need a space measuring 900mm x 900mm. ‘L’ Shaped, Curved & Diagonal Corner Wall Cabinets – When planning this type of corner cabinet, you’ll need a space measuring 600mm x 600mm. What is a Le Mans corner unit? Hi Mike, as the Tandem Larder Mechanisms usually fit to one side of the Larder unit and the Top and Bottom of the unit, in theory, you should be able to fit it into a Corner Larder Unit. However, this unit would require the door to be hinged to the gable end of the unit and not the Corner Post, which is the case on our Corner Larder Units. Therefore, I would recommend ordering a standard Swing-out Larder and simply blanking the Corner Space off. what size draws come in the 900 and 800 units? can the units be cut down to take in a boxed in soil pipe in far corner of room, if not how would you suggest getting round it? Hi Dan, I’ve knocked this article up for you, which should give you some ideas on how to get around a soil pipe. Can I change the right hand unit to 800mm ?? Hi, I’m not able to give you an answer to this, as I don’t fully understand your question. 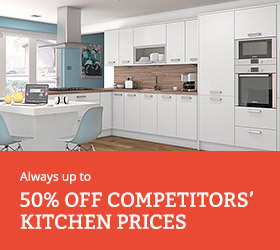 If you give our sales a team a quick call on 01977 608 418 then they should be able to assist you. I have an unusual corner in that one side will be occupied by an integrated washing machine with appliance door, and the other will just be a standard base unit (so no service void). This is because I need to be able to reach plumbing in the corner, and this will be possible by simply pulling out the washing machine, and reachine down the side of the base unit. Looking at the diagram above, imagine Unit A will be my washing machine, and Unit B my base unit. So I need to attach my Luca corner post to the end of the base unit (so Unit B if comparing to the above illustration). Presumably there should be no issue with this, provided I just use correctly sized blocks/bracket to attach to the base unit? Hi, that’s fine. You can use a void corner and just use a corner post instead. You will end up with the same dimensions and appearance as the diagram, barring the extra storage of the corner base. Hi – are there any plans to introduce a range of corner drawer units? Hi, there are no plans to introduce corner drawer packs but you could fit a pack diagonally and then run units off either side if required. Hi the l shaped corner base units I see they come in standard size of 900×900 but is it possible to have it made to 700×700? Hi, sorry but they are only available in 900x900mm. Do I need a corner post for a corner wall cabinet or do I just use a filler piece? Filler pieces are fine to use. You do not require a full corner post unless you want to mirror the exact finish below but this does mean ordering another base corner post and this will need to be cut and altered on site by the installer. I have a corner which due to a window recess etc is not a true space (think more M-shaped with smaller square shape occupying the internal corner). I think my only option would be at one side to say have an 800 unit, with a 500 door and a corner post. Will this work? I take it there are no holes for the corner post to be fitted, and it has to be manually positioned/fixed anyway? A possible alternative (though the cutout looks a bit small) is for me to use SKU FD99-PWS – it is 900 wide but what is the width of each side, before the triangle cut-out in the corner? 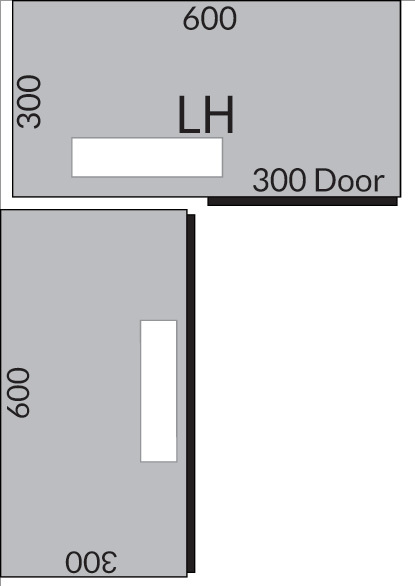 The page below shows corner units and their corresponding door sizes. There is always a blanking panel of 500mm on standard corner sizes. If one could be made 800 wide then your door size would be 400mm, the same as the blanking panel to achieve the 800 width. With regards to the corner post, there are no holes for this, it is screwed into position using the units either side, once you have offered all the units up to the walls so that you can see the exact size the corner post needs cutting down to. Need to measure when I get home if the L-shaped and its void is suitable. But, in theory I could have a normal base unit (say 800 but this was just arbitrary rather than exact) with a door (lets say 600) fitted, then I just fit a corner post (40 thickness, or is it 70 – not important at this stage) adjacent to the door and it would leave a remaining gap of approx 160 remaining which could be hidden by the other right-angled run of cabinets? What you are saying is possible but it would not be ideal. 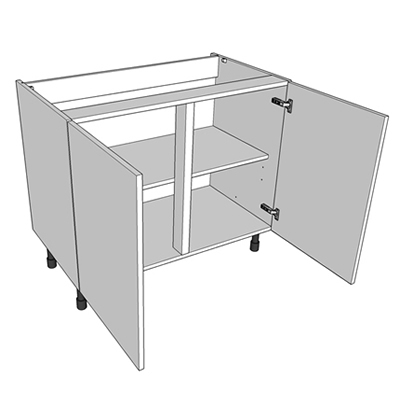 An 800 normal base unit comes with 2 x 400 doors fitted, that open from the centre outwards. In theory there is nothing stopping you ordering another door at the size you need and attaching this to the 800 wide unit. The 800 unit also has a centre post inside the unit going from top to bottom as shown below. (FD8). A bigger door would fit but would overlap this a lot. You would then need your corner post to go around the corner to the adjacent unit. A corner post can be whatever size you need but you need to remember that standard base units are 560mm deep. The other right angled run of cabinets need at least 580mm from wall to door. The additional space taken by the corner post then gives you space to open your doors without handles clashing. These may be a good articles to read, they have diagrams to show how units meet in the corner as well as info on service voids. Stupid questyion but… do corner units need a corner post? Standard corner base units like the ones shown on the page below do need corner posts. The L shaped corner units below don’t need corner posts as the door gives you the 90 degree return that you need. I am looking at putting in a standard corner base cabinet in my kitchen. However there will be no units on the return as this space will have a free standing washing machine. Therefore, I presume I don’t need a corner post? Do I need anything like an end panel to make the space underneath the worktop look nice? Can the corner post be cut down at all? In my plan I have 65mm left over in the corner. Would this be sufficient to avoid clashing of doors? We do advise now to have a corner post of around 70mm. 65mm should be OK but you may need to choose handles that don’t stick out too much to prevent handles from clashing. In cases where the gap is more than 70mm, I’m assuming I could cut down a larger piece to make a ‘custom’ corner post. Can you please advise which product I would use to do this? Our corner post material is 100mm wide so that it can be cut down. An example of the corner post that you would need is below. Thanks again for this good advice. Final question: I have a gap between units in the corner which is greater than the 100mm allowed for in your standard corner post. 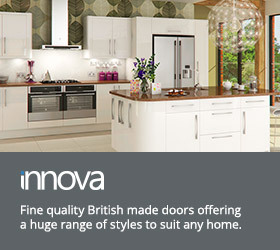 Is there a bigger product available in door material which can be cut down to size? you could order an end panel in door material and cut it down but a corner post greater than 10cm might look a bit too big. It might be worth trying to get slightly bigger units to absorb some of that space or get a slightly smaller unit somewhere in the run and put in a 100mm wide unit, for example, as shown below. Yes you can, the corner post in most ranges is sent in 2 pieces, so you can cut them to size. They are designed to give enough clearance for the doors and handles to clear each other. 70mm x 70mm is a good size for a corner post. In the above diagram you show the unit to be 600mm depth plus 30mm space for corner post, however as your units are only 560mm depth plus (on average) 20mm door, doesn’t this mean you would already have a 20mm space from the edge of the door to end of the worksurface? Would you need a 50mm corner post? In the diagram above, the top unit has a depth of 560mm +70mm corner post = 630mm. How do I secure the corner post in? There don’t appear to be any fittings or spaces for nails. Should it be glued? Any recommendations on best type of fixture? A corner post can be secured into place with some small brackets and screws, alternatively it could be glued into position but if you ever had to remove it then it could damage the units that it is attached too. Screws and brackets are probably the best way to go.